Ep 2018:50 – Rams Talk tour checks in on Cowboys and Dolphins: Rams Talk’s Derek Ciapala checks in with Cowboys Cast host Bobby Belt and Welcome to Perfectville host Sam Marcoux. Ep 2018:49 – Checking in With the Falcons and Lions, How Do the NFC’s Best Stack Up? : Derek Ciapala and Norm Hightower continue Rams Talk Radio’s tour around the league with Locked on Falcons’ host Aaron Freeman and USA Today Lions Wire writer and Lions Breakdown host Erik Schlitt. Ep 2018:48 – Rams great Roman Gabriel discusses his career: Derek Ciapala is joined by the 1969 NFL MVP for a wide ranging discussion including Gabriel’s best moments with the Rams, the difference between the game then and now, and whether or not he should be in the Hall of Fame. Later, Derek and Steve Rebeiro discuss Steve’s guide for new bandwagon fans, Aaron Donald’s contract situation, and the season-ending injury to Morgan Fox. Ep 2018:47 – Rams Talk checks in with the Packers and Eagles: Derek Ciapala and Steve Rebeiro continue Rams Talk’s tour around the league with Pack to the Future’s The Sweep host Fred Thurston and NJ.com Philadelphia Eagles beat writer Zack Rosenblatt. Ep 2018:46 – Tour continues with the Chiefs and Texans: The Rams Talk tour around the league continues with AM 1510 and FM 94.5 ESPN Kansas City (Almost) Entirely Sports host Joshua Brisco and Houston Sports Talk and Locked on Texans host Robert Land to talk Kansas City Chiefs’ and Houston Texans’ offseasons. Ep 2018:45 – The tour checks in with the Jaguars and Buccaneers: Derek Ciapala and Norm Hightower visit with USA Today Jaguars Wire managing editor and Jags Den podcast host James Johnson to talk about the Jacksonville Jaguars’ moves this offseason. Then we interview the Pewter Report’s Trevor Sikkema to get the lowdown on the Tampa Bay Buccaneers’ moves thus far. Each give their take on what the Los Angeles Rams have done this offseason as well. Ep 2018:44 – Touring with the Broncos and Bears, Rams’ camp talk: Derek Ciapala and Steve Rebeiro check in with the Denver Broncos with Mile High Sports’ Bronco Blitz host Ronnie Kohrt. Then they visit with Da Bears Brothers’ Brandon Hazelett to discuss the Chicago Bears’ roster improvements. Finally, the guys talk about what they want to see out of the Rams’ young players in OTAs. Ep 2018:43 – Tour continues with Raiders and Vikings, Jim Everett talks L.A. Rams: Derek Ciapala, Norm Hightower and Johnny Gomez continue Rams Talk’s Tour Around the League with Raiders Snake Pit’s Bill Williamson and Locked on Vikings’ Sam Ekstrom. Then former Los Angeles Rams’ great Jim Everett visits to talk about the team’s draft and offseason. Ep 2018:42 – Rams Talks tours the NFL with the Cardinals and Chargers: Derek Ciapala, Norm Hightower and Johnny Gomez sit down with USA Today Cardswire’s Jess Root to get an overview of the Arizona Cardinals’ 2018 offseason. Then Bolts from the Blue’s Garrett Sisti joins the show to break down the Los Angeles Chargers’ offseason. 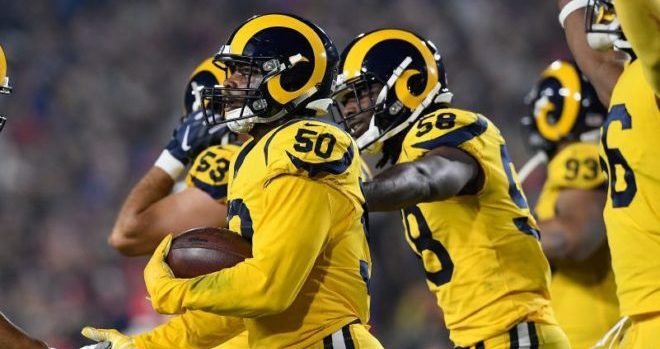 Finally, the guys end the show with a brief, and let us stress brief, discussion on the newest Los Angeles Rams uniform news. Ep 2018:41 – Checking in with the 49ers and Seahawks, Rams DE John Franklin-Myers visits: Derek Ciapala, Norm Hightower, and Johnny Gomez visit with Legion of 12/USA Today Seahawks Wire’s Corbin Smith to discuss the offseason up in Seattle. Then 49ersHub’s Kevin Molina joins to explain where the 49ers stand after an eventful offseason. Finally, Rams Talk Radio tops it all off with rookie Rams DE John Franklin-Myers, who addresses what it will take to be successful and prove himself in the NFL. Ep 2018:40 – Analyzing the L.A. Rams’ 2018 Draft Class: Norm Hightower, Johnny Gomez, and Derek Ciapala break down the Los Angeles Rams’ 2018 draft class. They go through each pick and look at what role these young rookies will play for the Rams. Ep 2018:39 – Coverage of Round 4 of the 2018 NFL Draft: Derek Ciapala, Norm Hightower and Johnny Gomez break down the fourth round of the 2018 NFL Draft. They analyze the Rams’ two picks in the round and the players still left on the draft board. Ep 2018:38 – Day 2 of the 2018 NFL Draft, L.A. Rams take T Joseph Noteboom: Derek Ciapala, Johnny Gomez, and Norm Hightower pick up where they left off with the first round of the draft. They dissect the high impact picks and analyze the Los Angeles Rams’ only selection of the first three rounds, offensive tackle Joseph Noteboom. Ep 2018:37 – Walking through the first 14 picks of the 2018 NFL Draft: Derek Ciapala and Norm Hightower go through the first 14 picks of the 2018 NFL Draft. They debate the Cleveland Browns’ surprise decisions and analyze how the other teams met their needs. Ep 2018:36 – Rams Talk’s 100th episode! Ft. CBS Sports’ Eric Galko and L.A. Rams Hall of Famer Jack Youngblood: The guys bring it with a packed 100th episode. Derek Ciapala and Norm Hightower look at the 2018 NFL Draft with CBS Sports’ Eric Galko. Then Norm sits down with Rams’ legendary Hall of Famer Jack Youngblood to discuss his life and career on and off the field. Ep 2018:35 – L.A. Rams schedule revealed, draft talk with NFL insider Benjamin Allbright: Derek Ciapala and Norm Hightower go over the 2018 Los Angeles Rams schedule, featuring five primetime games. They also discuss the upcoming draft with NFL insider Benjamin Allbright. Finally, they profile linebackers and edge rushers available in the draft. Ep 2018:34 – The Battle for L.A. and the Rams’ outlook in 2018: Derek Ciapala and Steve Rebeiro look at the status of the Battle of L.A. and the Los Angeles Rams’ newfound status as a destination team. They also discuss a recent article arguing that it’s not a given the Rams reach the Super Bowl next season. Ep 2018:33 – L.A. Rams preseason schedule, Color Rush uniforms, and Robert Quinn: Derek Ciapala and Steve Rebeiro discuss the Los Angeles Rams’ 2018 preseason schedule, the end of the “Color Rush” uniform, and Robert Quinn’s remarks about the Rams. Ep 2018:32 – Grading the L.A. Rams’ offseason moves: Steve Rebeiro and Johnny Gomez grade the Los Angeles Rams’ offseason moves. They also look at the team’s options in the third round of the upcoming 2018 NFL Draft. Ep 2018:31 – Surprise! L.A. Rams trade for WR Brandin Cooks: Norm Hightower and Derek Ciapala break down the L.A. Rams’ deal for New England Patriots wide receiver Brandin Cooks. They debate the overall value of the deal and what else the Rams can do to fill holes on the 2018 roster. Ep 2018:30 – Gronk, OBJ, and L.A. Rams mailbag: Derek Ciapala and Norm Hightower debate a rumored move for New England Patriots tight end Rob Gronkowski. They also answer your questions in a huge mailbag. Ep 2018:29 – Are the L.A. Rams getting arrogant? : Derek Ciapala and Norm Hightower look at the L.A. Rams’ possible trade for New York Giants WR Odell Beckham Jr. They also respond to Fox Sports’ Jason Whitlock’s comments on the Rams being arrogant. Finally, they break down the impact Ndamukong Suh will make on the roster. Ep 2018:28 – Suh signs with L.A. Rams, could Odell Beckham Jr. also be on the way? : Derek Ciapala, Norm Hightower and Steve Rebeiro break down the Los Angeles Rams’ signing of 5-time Pro Bowl defensive tackle Ndamukong Suh. They also address rumors the Rams are interested in New York Giants WR Odell Beckham Jr.
Ep 2018:27 – L.A. Rams wait for Ndamukong Suh: Derek Ciapala and Norm Hightower discuss the Los Angeles Rams’ wait on DT Ndamukong Suh and the remaining free agency market. They also discuss which teams were the best in Rams’ history. Ep 2018:26 – Will the L.A. Rams sign DL Ndamukong Suh? : Derek Ciapala and Norm Hightower discuss DL Ndamukong Suh’s visit with the Los Angeles Rams. They look at how he fits on the roster, how much he’d cost, and what potentially signing him says about the team. The guys also question whether or not another free agent, Johnathan Hankins, is a better fit. Ep 2018:25 – L.A. Rams keep Austin and Sully; Now what? : Derek Ciapala and Norm Hightower discuss the Los Angeles Rams’ re-signing of Tavon Austin and John Sullivan. They also talk about what’s next for the Rams with most of the prospective high-end free agent targets signed elsewhere. Ep 2018:24 – Sammy Watkins leaves, Nickell Robey-Coleman stays with L.A. Rams: Derek Ciapala goes over the last day of the “legal tampering” period before the NFL begins free agency. Among the news items, WR Sammy Watkins leave the Los Angeles Rams, and CB Nickell Robey-Coleman stays. Ep 2018:23 – L.A. Rams great Jim Everett talks free agency, salary cap and more: Los Angeles Rams great Jim Everett joins the show to give his take on the team’s moves this offseason. He breaks down the salary cap, looks at positions the team should address next, and gives an honest take on big money contracts. Ep 2018:22 – L.A. Rams sign Sam Shields, trade for Aqib Talib: Derek Ciapala and Norm Hightower bring their quick hot takes on the Los Angeles Rams’ signing of Sam Shields and trade for Aqib Talib. They briefly look at the impact on the team and consider what’s next as the Rams enter free agency. Ep 2018:21 – L.A. Rams franchise Lamarcus Joyner, trade Alec Ogletree: Derek Ciapala and Norm Hightower react to the Los Angeles Rams’ decisions to franchise Lamarcus Joyner and trade Alec Ogletree. They ponder what’s coming next as the Rams reload on defense. Ep 2018:20 – The L.A. Rams have some work to do: Derek Ciapala and Norm Hightower analyze the Robert Quinn trade and ask the question: what next? With numerous holes on the roster, they look at what avenues the Rams can take in free agency and the draft to fill those needs.